Stainless Steel Can Koozie - Double-Walled Vacuum Insulated - For 12-oz Drink Cans | BUDK.com - Knives & Swords At The Lowest Prices! On hot days cold, refreshing canned drinks turn to lukewarm swill before you can even finish them. They fare no better in cool weather or even indoors, as the heat from your hand alone is more than enough to warm your ice-cold, fresh-out-of-the-fridge canned beverage to room temp within mere minutes. 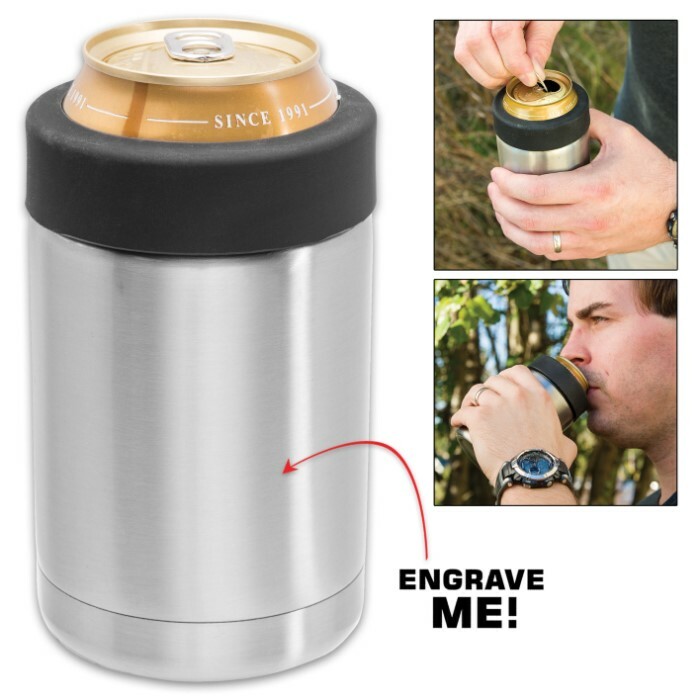 But when you slide a cold can into this stainless steel koozie, neither sweltering summer sun nor body heat can thaw your drink's frosty chill. 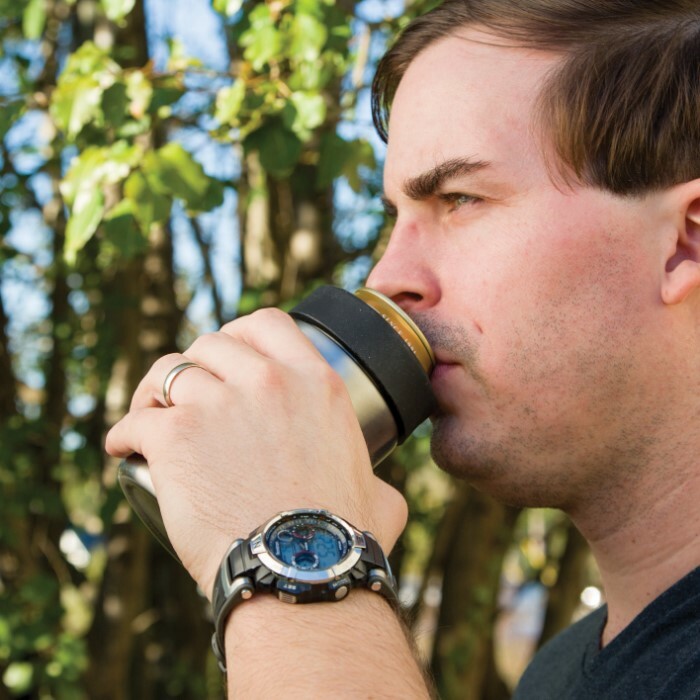 A far cry from cheap, ineffective foam koozies, this supercharged can cooler boasts state-of-the-art double-walled vacuum insulation and ultradurable, corrosion resistant stainless steel construction. 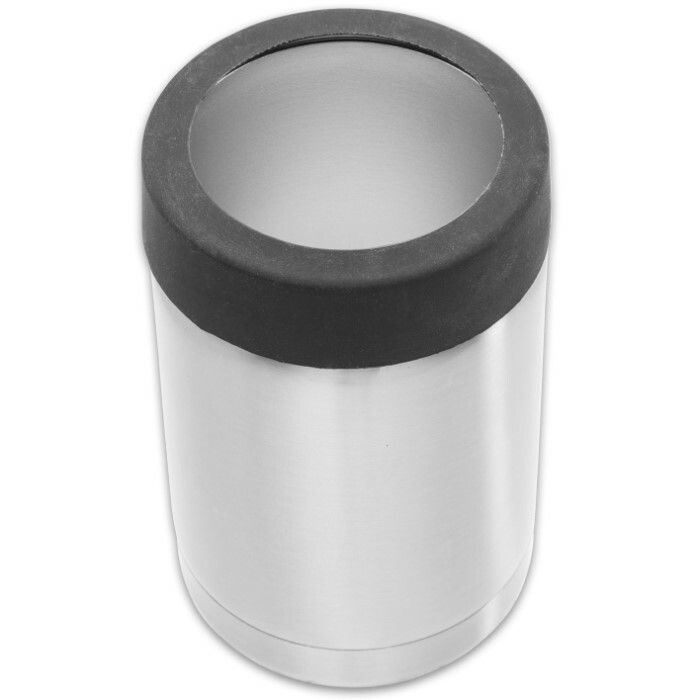 It keeps canned drinks at a constant temperature for hours, ensuring the last gulp of your chilled beer, soda or other canned beverage is just as crisp, cold and refreshing as the first - whether you guzzle it down in minutes or sip it slowly and gingerly. No more choking down those last few unpalatably tepid swigs of lager! 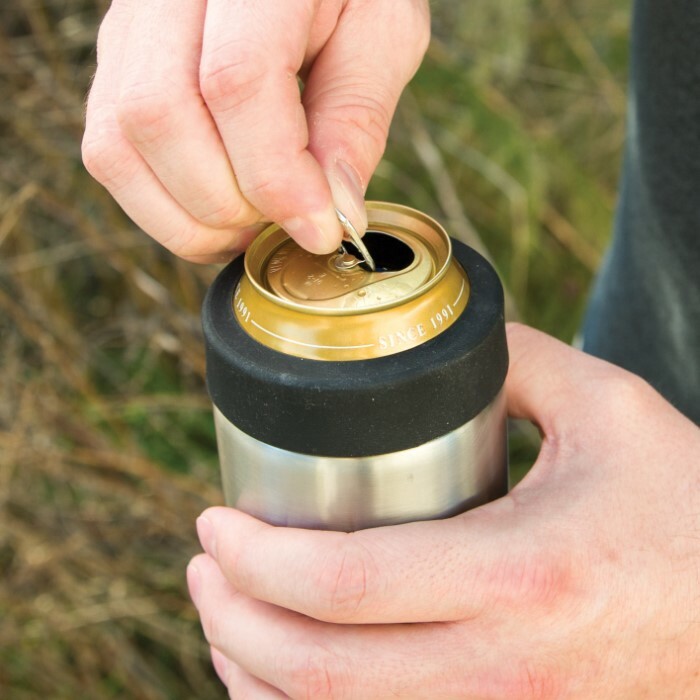 Cold, bare cans quickly become annoyingly slippery with condensation, but this impeccably insulated super-koozie stays dry and easy to grip. 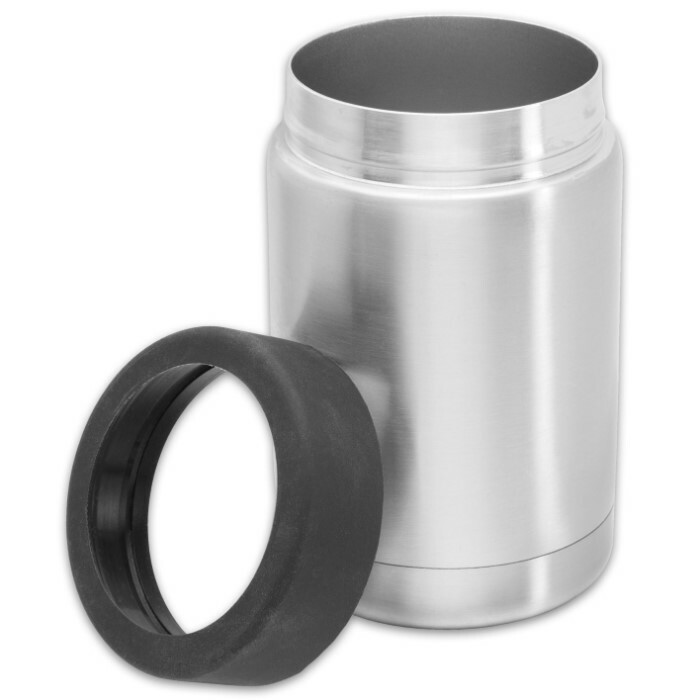 The rubberized rim keeps cans snug and secure, while providing an insulation-enhancing airtight seal. Perfect for travel, the koozie fits easily in most vehicle cup holders. It also makes a fantastic gift, especially when personalized with an engraving of the recipient's name, initials or art related to a personal interest or favorite hobby. Why waste your time pouring your canned beverage into an ice-filled glass? The fast-melting ice dilutes it, and the glass is just one more dish to clean. This handy koozie lets you enjoy your favorite beverage straight from the can - ice-cold until the last drop, no ice necessary!